This recipe will make 10 – 12 crab cakes. The crab cakes are rich so most people will only eat 1 or 2 (this recipe can easily be cut in half). In a bowl, whisk together the eggs, Worcestershire sauce, lemon juice, prepared mustard, mayonnaise, dry mustard, and Old Bay Seasoning. Gently fold in the crabmeat, parsley and breadcrumbs. Shape the crab mixture into serving size patties, about 3″ in diameter by 1″ thick. Cover loosely with plastic wrap and refrigerate a minimum of 2 hours. When ready to cook the crab cakes, heat a griddle or large, flat frying pan over medium heat. Melt the butter. Saute the crab cakes in the butter, turning, until both sides are nicely browned (about 4-5 minutes on each side). Serve immediately. Crab cakes can be served plain or with tartar sauce. Combine mayonnaise, relish, lemon juice, and pepper. 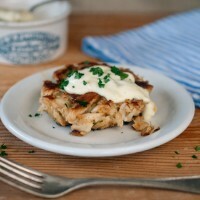 *Note: Total time for our crab cake recipe includes 2 hours standing time in the refrigerator. Aww, Mammaw would be proud!! Karen, I love that you shared her recipe and that her legacy lives on so deliciously in our lives. I still have the e-mail (from 13 years ago!) where you shared the recipe. In the directions you said, “…Saute in butter…Serve to your drunken friends…” We try and follow your directions precisely.